A Celtic band is not only beautiful, but carries a long history and tradition behind it. Celts were highly spiritual people with a passion for art. It is this creativity and spiritualism that is infused into the Celtic designs. Celtic designs are finding favor among many couples for being unique and meaningful, making them ideal for bands. Celtic marriage rings are universally thought to represent the interweaving of two lives into a connected whole. Because the pattern is continuous around the ring, it is thought to symbolize the unending love and continuity of a relationship. The Celtic patterns can be very complex, especially on thicker bands. There are endless variations among the knot patterns, from graceful, flowing braids to rigid, angular designs. Many ascribe specific meanings to these patterns. Simple, smooth patterns with flowing curves may represent the harmony and ease that a couple shares, while a more angular pattern can be symbolic of the foundations and stability of marriage. In reality, there is no formal directory of what Celtic designs signify. Couples can simply choose the patterns that describe their individual personalities and interpret the meaning to suit their individual relationship. 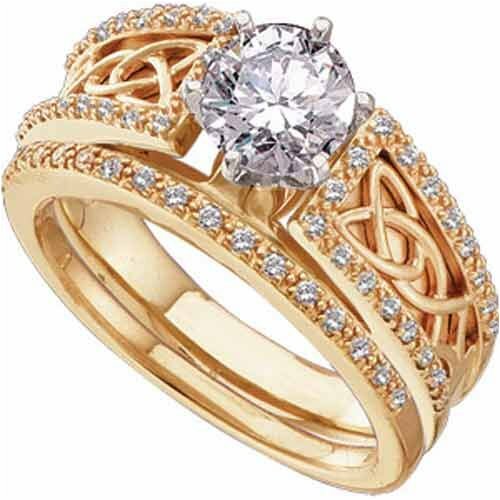 Rich with symbolism, mystery, and romance, Celtic wedding rings are a popular choice with today brides and grooms. With a nearly infinite range of designs to choose from, it is possible to find the perfect ring to represent the eternal bond that the couple forges on their wedding day. Celtic wedding rings can be made as a solid band with knots carved, or as raised scrolls, or as engravings. Alternatively Celtic wedding rings can be made entirely from a knot pattern, with intertwining metals used for a more delicate appearing ring. For something with a little more of a statement, these styles of wedding and engagement rings can also be made with diamonds set in them. Diamonds can be placed in the middle of each knot, between each knot, or alternatively at one one or both edges of the wedding ring. One of the most well recognized and used Celtic knots would be the Trinity knot. The Trinity knot, as the name would suggest, comprises 3 rounded triangles linked together and features points at the outer edges. This knot can stand alone or be worked so that numerous knots are linked together. The Trinity knot is often known as the Love Knot and can have several meanings, including the ancient Celtic, which is representing Celtic Gods and Goddesses, and the Christian, which is representing the Holy Trinity. This entry was posted in Antique engagement rings, Engagement rings, Gold engagement rings, Vintage engagement rings, Wedding engagement rings and tagged bands, braids, bride, brides, brides and grooms, celtic band, celtic designs, celtic marriage, celtic patterns, celtic wedding rings, couple shares, diamond, Diamonds, endless variations, engagement, engagement rings, engravings, eternal bond, forges, infinite range, knot pattern, knots, love, marriage rings, Relationships, ring, rings, Romance, spiritualism, tradition, wed, wedding, wedding day, Weddings on May 21, 2009 by admin.